Dr Annuar (third right) in a group photo with workshop participants. SIBU: District education officers and school headmasters must work together with their local elected representatives to improve the education standard in their respective areas. Assistant Minister of Education and Technological Research Dr Annuar Rapaee said this should be done regardless of the political affiliation of the elected representatives. The Nangka assemblyman said he had set up 24 tuition centres in longhouses and five tuition centres for Sijil Pelajaran Malaysia (SPM) students in his constituency. “I do not mean to boast, but schools in Nangka constituency showed improvement in their examination results. For example, SMK Agama managed to obtain a school average grade (GPS) of below 4.0 in SPM 2018. 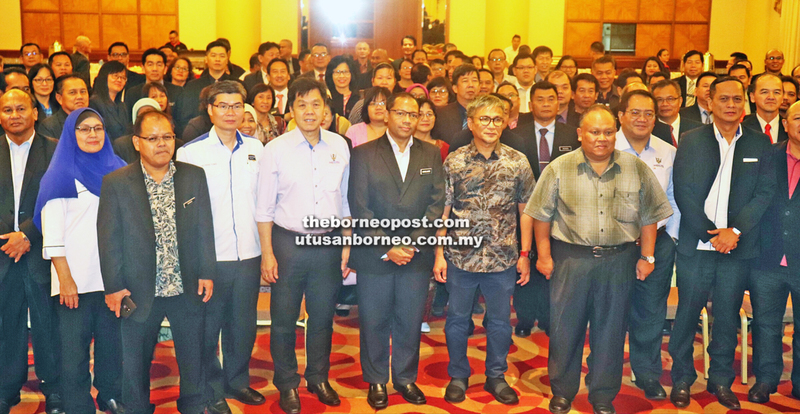 “Another school, SMK Kampung Nangka, was the second best in Sarawak after SMK Chung Hua Sibu in Sijil Tinggi Persekolahan Malaysia (STPM) 2018,” he said when officiating at a workshop titled ‘Empowering Sarawak Primary Schools Management and Leadership’ here on Tuesday. The workshop was attended by 104 district education officers and headmasters from central zone schools. It was organised by the Ministry of Education, Science and Technological Research in collaboration with Aminuddin Baki Institute. Dr Annuar said the current political situation has changed in that both MPs and assemblymen are given allocations by the federal and state governments. “So they (elected representatives) cannot say that they do not have the funds to help schools in their areas. For me, I spend hundreds of thousands of ringgit from my allocation for education purposes in my area,” he added.